Lochailort is described in an authoritative guide to the buildings of Scotland as "little more than a place name with a telephone kiosk at the head of Loch Ailort where the A861 joins the A830." Maybe they were pressed for space, but that description undersells the facilities and certainly the charm of this beautiful place. 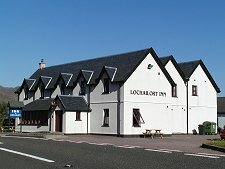 The origins of Lochailort date back to at least 1650 when an inn was recorded here, and by 1750 the settlement had grown enough to feature on a map as Kinloch Hoylort. Early in the 1800s Lochailort saw its first road with the arrival of Thomas Telford and his "Road to the Isles" from Fort William to Arisaig, and much later to Mallaig. The first road builders were followed in the 1890s by Sir Robert McAlpine, builder of the West Highland Railway from Fort William to Mallaig. At the height of construction, a small town was built here to house the 2000 navvies needed to drive the railway through the harsh rocky environment, complete with its own hospital in an old schoolhouse. The line was eventually opened in 1901, and remains an impressive feat of engineering. 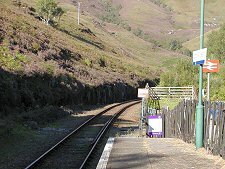 There are seven tunnels within a few miles of Lochailort Station, the longest being 350 yards long. More obvious are the viaducts. 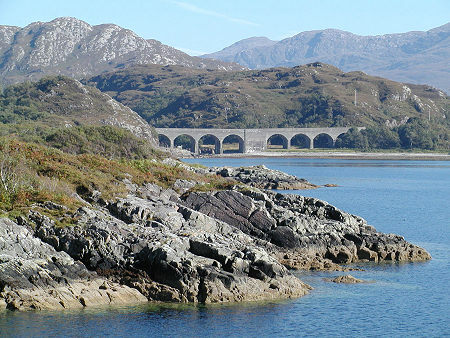 At the head of Loch nan Uamh, three miles west of Lochailort, is the Loch nan Uamh or Gleann Mama Viaduct. This is an eight arch viaduct made of "Concrete Bob" McAlpine's favourite material. Though smaller than the Glenfinnan Viaduct, there are those who feel that with its coastal setting the Loch nan Uamh Viaduct is even more inspiring. The road builders returned in the 1900s. In 1966 a new coastal road was built south to Glenuig providing a loop through Moidart and an alternative way of reaching Acharacle and Ardnamurchan. And in the 1990s the road to the west of Lochailort as far as Loch nan Uamh was improved out of all recognition as part of the continuing upgrading of the A830 Road to the Isles. 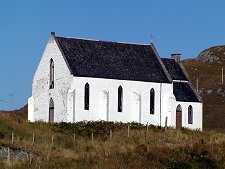 As the new road climbs west from Lochailort it passes one of the area's most notable landmarks, the Our Lady of the Braes Roman Catholic Church. This was consecrated in 1874, but has been largely disused since 1964 except for a brief moment of fame when it featured in the church scenes in the classic 1983 film Local Hero. It is likely to come back into use as a private home. The focus of Lochailort is the junction between the A830 and the A861. Nearby is the Lochailort Inn, well placed to enjoy spectacular views to the south and west. Down the hill to the south you pass the extensive premises of the fish farming company Marine Harvest to your left. 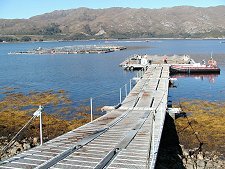 Access is not usually possible on health grounds (the health of the fish), but here they breed salmon and other species to provide stock for their operations scattered across the western Highlands. More evidence of the importance of this industry to the Highlands can be seen from their farming units in Loch Ailort itself. 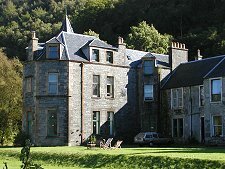 On the opposite side of the A861 from Loch Ailort is Inverailort House. This started life as a farmhouse, but was increased in size and converted to a shooting lodge in 1875, with further additions in 1891.